12:41 p.m., March 15, 2012--Mary Kaye Carpenter, 94, died at home in the presence of her family on March 14. 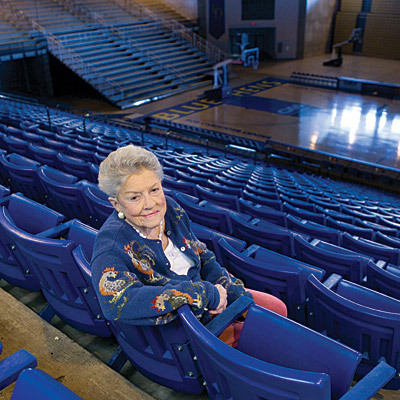 Mrs. Carpenter, a longtime friend and benefactor of the University of Delaware, was awarded UD's Medal of Distinction at Winter Commencement in 1996. She was honored as founder of the Pilot School in Talleyville for students with learning disabilities, as an active member who helped found the DFRC and as a noted philanthropist who supported many charitable causes including the Medical Center of Delaware. The Medal of Distinction citation read, in part, "Mary Kaye Carpenter, today we publicly recognize your unfailing charity toward others and, on behalf of children and families of Delaware, and for others whose lives you have touched, we thank you." Born in Louisville, Ky., on Sept. 11, 1917, she grew up in Wilmington, Del., as her father pursued a successful career with the DuPont Co. In 1937, she met Bob Carpenter. They were married on June 18, 1938, and had 52 years together until his death in 1990. Over the last 70 years, Mrs. Carpenter helped start or lead many successful organizations and events in the community. In 1956, she was instrumental in the creation of the Pilot School that over 50 years later is thriving in its mission to help children who are struggling in traditional teaching environments. In the mid-1960's, she opened Bootiful, a successful shoe store in Greenville. She helped start the Holly Ball and served on community support organizations such as Christiana Care's Junior Board, the Junior League and the Delaware Foundation Reaching Citizens with Intellectual dis-Abilities (DFRC). In addition, she was a member of the Wilmington Country Club, the Vicmead Hunt Club, the Bidermann Golf Club and a past member of the Rehoboth Country Club. Her circle of friends stretched across the country, from Clearwater, Florida and her times with the Phillies in spring training, to Greeleyville, S.C., and Rehoboth Beach, Del. Her survivors include her daughter, Coo Murray and her husband, Jamie; her sons, Ruly Carpenter and his wife, Steph, and Keith Carpenter; her grandchildren, Bobby Carpenter, David Carpenter, Cinda Cattermole, Bree Wellons, Allison Carpenter and Laura Carpenter; and her great-grandchildren, Morgan Carpenter, Abigail Carpenter, Travis St. Clair, Logan Carpenter, Olivia Carpenter, Zack Cattermole, Katrina Cattermole, Josephine Wellons and Kemble Wellons. She was preceded in death by her husband, Robert R. M. Carpenter Jr., her sister, Jane M. Krieger, and her son, Kemble duPont Carpenter. Memorial donations may be made to the Pilot School, "Mary Carpenter Circle of Friends," 100 Garden of Eden Rd., Talleyville, Wilmington, DE 19803.